What are our "Tours a la Mexicana"? When one hears the word "Mexico", thoughts of bright colors, love songs and carefully detailed art come to mind. We also think of a wealth of smiles, warmth and the attitude of the people to be available to attend to your every need. 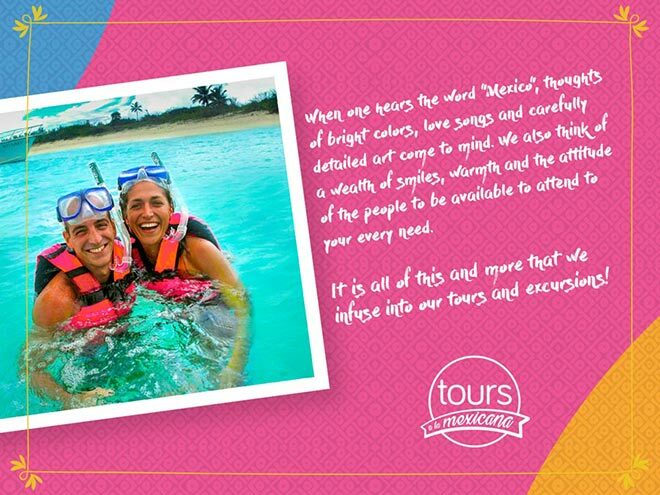 It is all of this and more that we infuse into our Cancun tours and excursions! "Our guides create a relationship beyond the formal, joking respectfully with our guests and even asking the tourists to affectionately call them by their nicknames. This personal service and attention is what we have built our business upon. In addition to including the name of the employee on their badge, Hector, for example, each guide has their nickname on the back of his uniform shirt, La Foca, in this case, and that brings a lot of laughter and confidence to the people! Just like visiting any friend's house in Mexico, in our Plus Cancun tours our guests are pampered every step of the way with a little water, a refreshment or an icy cold beer.